The rounded edges, refined LED light and smart finish of the Samsung CLX-3185 printer complements your office desktop. Get crisp print, copies and scans of your documents with the 2,400 x 600 dpi resolution of this Samsung laser printer. 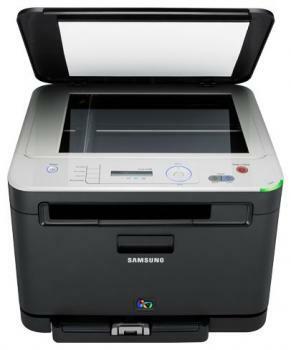 The one-touch print screen button of this Samsung multifunction printer makes the printing process quicker and simpler. The one-touch eco copy button of the Samsung CLX-3185 unites four separate documents into one single document to save your per sheet printing time. The AnyWeb Print software of this Samsung multifunction printer lets you access the web and lets you print web pages. The ready mode of the Samsung laser printer prints first page at a speed rate of 14 seconds (black) and 26 seconds (color) for speedy prints. Stay updated with your prints status with the 11 different job status indicators of the Samsung CLX-3185 printer. It multi-tasks so you dont have to.